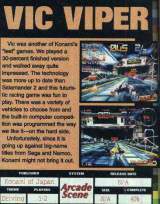 Vic Viper © 1995 Konami Company, Limited. Futuristic racing game starring the Vic Viper. It is believed the game was canceled shortly after it was announced. According to EGM (Electronic Gaming Monthly), the game was finished at 40% in November 1995. The Vic Viper is the ship you control in the "Gradius" series.